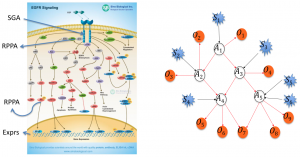 The Cancer Signaling Pathways project seeks to discover the genomic drivers of tumors and the cell signaling pathways that are being abnormally affected, driving the development of cancer. The ability to discover and model these causal relationships accurately is a key step in more fully realizing precision cancer diagnosis, prognosis, and therapy. We are analyzing The Cancer Genome Atlas (TCGA) data for breast and head and neck cancer to discover which somatic genetic alterations are causal drivers of a given tumor and which are causal drivers shared across different tumors as well as the causal relationships among signaling proteins in cancer pathways. Available data include measurements of somatic mutations, copy number alterations, DNA methylation, gene expression, microRNA expression, and reverse phase protein array (RPPA) data, which we collectively refer to as functional genomic data, as well as additional clinical data for many tumor samples submitted by the University of Pittsburgh to TCGA. We will take advantage of the Pittsburgh Genome Resource Repository, a collaborative effort of the University of Pittsburgh, the Pittsburgh Supercomputing Center, and UPMC, for faster data access and analysis.